Following the path which passes the right side of the statue of Ichigan Jizô-son, walking through the corridor, and climbing up the slope to the top, visitors find a white concrete one-story building with a step. 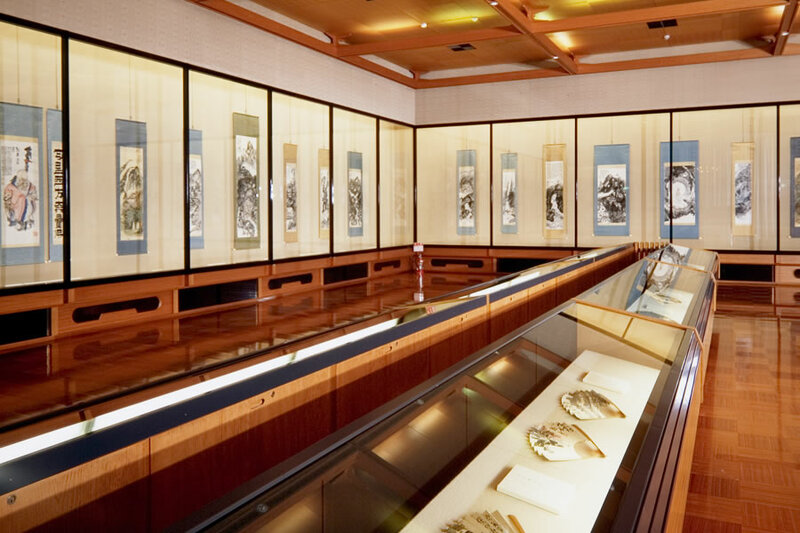 It is the Seikô-den museum which houses all artworks by Tessai Tomioka(1836-1924). 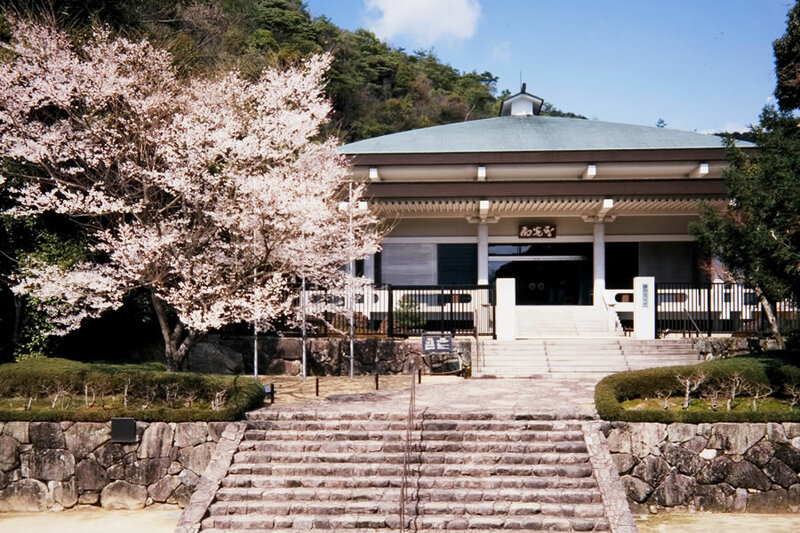 A tablet at the main entrance, which reads “Seikô-den” and the entrance plate, saying “Tessai Museum” were written by a master calligrapher, Shiryû Morita. Rocks collected from several scenic places such as Kibune, Kurama, Tenryû-kyô, and Iyo, which are noted in connection with Tessai, are placed in the front garden. 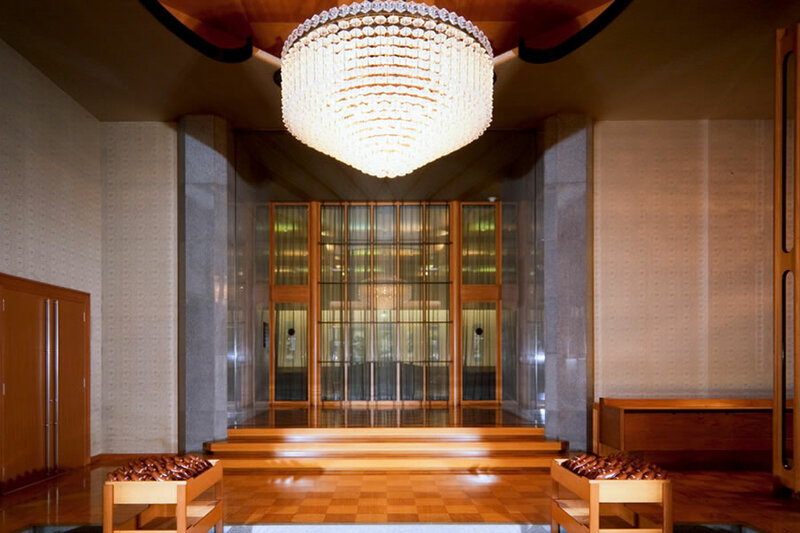 The ceiling of the exhibition rooms are boarded with excellent hinoki cypress wood from Bishû (Aichi prefecture) and the floors are boarded with high quality keyaki zelvoka wood, tochinoki Japanese horse chestnut wood, cherry wood, and others. Some part of the walls is coated with polished slabs and other part is coated with Nishijin silk fabric with woven design of Tessai’s seal. About 1200 art works by Tessai are kept in this building. Exhibitions of his works from the temple collection are held several times a year to show his masterpieces to the public. Tuesday through Sunday 10:00 a.m. – 4:30 p.m. Admission is until 4:00 p.m. When Monday falls on a holiday, the Museum is open on Monday and closed, instead, on the following day. There may be extra closed days for re-installation of the exhibits. Sometime will close during summer and winter times. Those who have elderly citizen’s ID or ID for the disabled are chargedhalf the price. Our temple does not sell amulets, force to hold incantations and prayers nor solicit for a contribution through personal visitation. Please be careful not to take other religious groups for our temple. In the temple compound, please do not carry around burning incense or candles for the sake of safety. Please make sure to offer burning incense or candles at the places with proper equipment for them. The reproduction,the modification,the quotation,and the resale,etc. without permission of all information and images are prohibited. Copyright © Kiyoshikôjin Seichô-ji Temple. All Rights Reserved.